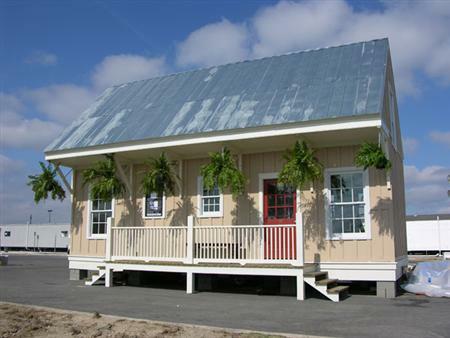 There was an article in Slate last week highlighting the ingenious Katrina Cottage, a low cost alternative to the FEMA trailer, for victims of hurricanes Katrina and Rita. The cost of construction of the Cottages (there are several designs) is the same or less than the trailers. In addition, they are designed to better resist future flooding and hurricanes (walls are constructed of a concrete board to prevent mold and mildew). FEMA, however, is a hard sell so far. These cottages make sense, they work as a longer term solution to the problem and provide a more comfortable living environment. Landscape Architecture magazine had its cover feature this month on Lawrence Halprin’s redesign of the Stern Grove Amphitheater off Sloat boulevard in San Francisco. 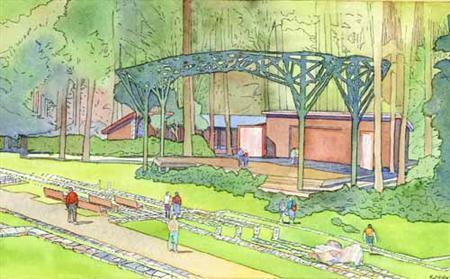 The amphitheater had deteriorated quite a bit after 75 years of use, and after a 20 million dollar renovation debuted in the summer of 2005 with free concerts every Sunday. Halprin helped transform it with his signature focus on using stone- one of his key inspirations was the ancient Greek amphitheater. Noted California architect Sim Van Der Ryn was on Forum with Michael Krasney on KQED radio today (listen here). It was interesting to hear some of his perspectives on green architecture, alternative energy, and associated topics. See this previous post on the Real Goods Solar Living Center for more information on Van Der Ryn. 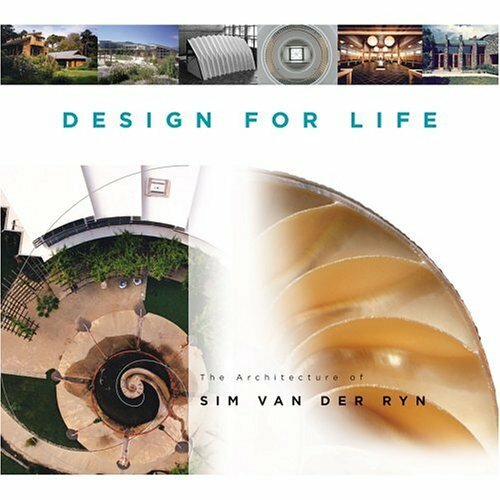 View details on Van Der Ryn’s new book Design for Life at Amazon. San Francisco Chronicle architecture critic Arrol Gellner has a couple of very interesting takes of the state of design review and its increasing restrictiveness and emphasis on conformity. 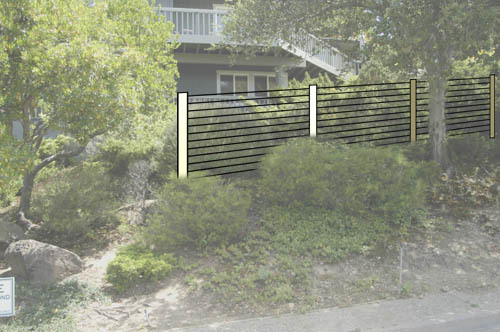 In Marin there are certainly some of the municipalities that are quite restrictive. There seems to be a correlation between the size of the municipality and the level restrictions placed on design. 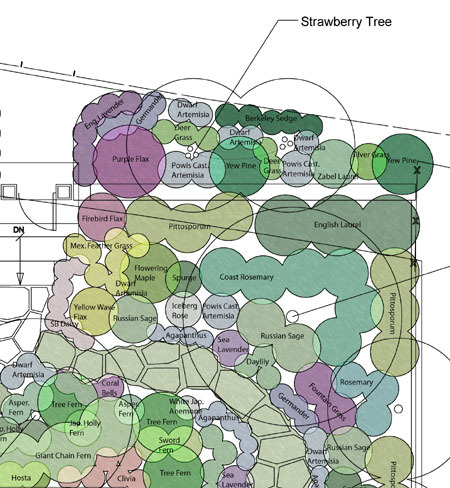 This is something that typically affects landscape projects less than building projects; but design review can get pretty restrictive even for landscapes. 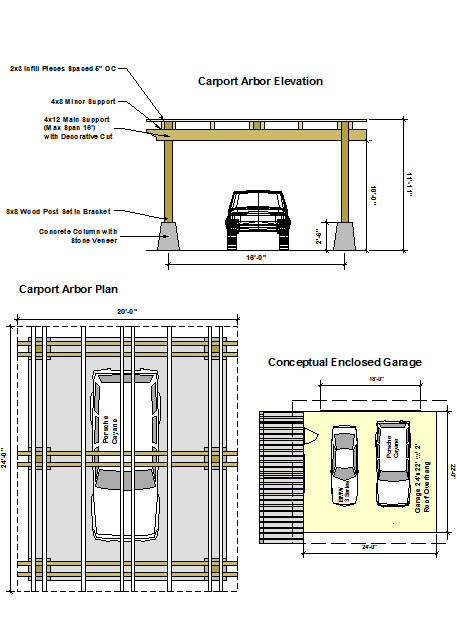 This is even more the case if the residence is in a PUD (Planned Urban Development) or HOA (Home Owners Association). Art or Eyesore- Would this Rotterdam, Holland Cubic Condo Pass Design Review in the U.S.? A very interesting look at “Mega Church” design in Slate that is worth a look. These churches looked to me more like symphony halls or rock concert settings than your traditional places of worship. Finishing off a week of lengthy landscape treatises, we turn to renown sculptor and at times landscape artist Isamu Noguchi. Isamu Noguchi was a unique figure among American artists of the twentieth century. He excelled in a wide range of genres and in countless media, in a career that spanned genres from the development of Modernism through Post Modernism. He created intriguing sculpture pieces, stage sets, paper lanterns, public spaces, landscape sculptures and architecture. His use of media extended from his favorite stone, to wood, metal, clay, mixed materials, and most importantly space. It was in the dimension of space that Noguchi thrived and his ability to bring art into the landscape was the hallmark of his career . Whether his work was a simple piece of carved stone or acres of a public park, Noguchi had an amazing flair for conceptualizing and designing things that were spatially engaging and which broke out of the box of traditional sculpture and art. Throughout his career he was always pushing the edge of what was considered art, and searching for ways to explore, and redefine personally what art indeed was. His experimentation, relentless drive and passion to create, pushed the limits of the art establishment throughout his over sixty-year career. With the larger canvas of the landscape, his stone sculptures reach a new and more powerful significance. Drawing on a rich cultural heritage and experiences from Japan, the United States, and time spent in Europe, Noguchi transitioned techniques and themes found in his sculpture into larger landscape projects. His forays in the landscape strayed from the traditional staples of sculpture. His landscape compositions are a unique fusion of both art and landscape. An examination of Noguchi’s origins places him in the proper perspective. Throughout his career, Noguchi sought to define himself and his work through a unique blending of his own personal context, in concert with his own artist’s prerogative. Noguchi was born in Los Angeles in 1904, the son of a Japanese poet, Yone Noguchi and an Irish-American writer, Leonie Gilmore. This duality of cultural backgrounds, heritage from his childhood spent in Japan, and later experience living in the United States would shape Isamu’s life and work. Noguchi referred to himself as an outsider because of his mixed-heritage and a less than stable family life that included a strained relationship with his father. Uneasiness and a lack of security shaped Noguchi’s life. According to Bruce Altshuler in his book on Noguchi, “Noguchi said he could feel at home everywhere because he was at home nowhere.” Perhaps it was this uneasiness, one that sat at the very core of his being, which would signal the purpose for his immense and diverse life’s work as an artist. Noguchi’s landscapes were far reaching in their scope, representative of the currents of the rest of his art as a whole, and spanned the many decades of his career. From his landscape Play Mountain (1934), which was a conceptual idea for a children’s playground that he conceived of early in his career, to his later works of landscape artistry, Noguchi maintained and continued to develop a refined design style and interaction between his art and the landscape. As time progressed, he polished his skills of combining sculptural elements with elements of the larger landscape. 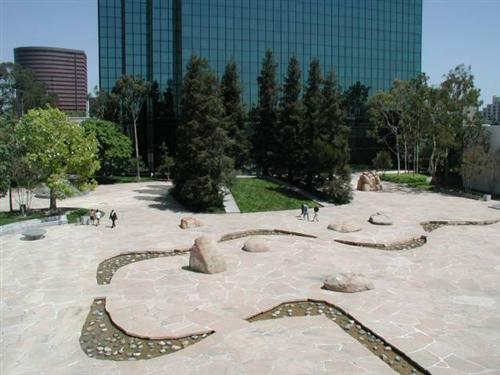 Of particular distinction is Noguchi’s work at what he entitled California Scenario (1980-82). It is here, at the end of his career, that Noguchi perfected his art. With an artists’ hand Noguchi crafted this amazing work of plant, water, and stone. Just off of the 405 freeway in Costa Mesa, California there are two clusters of uninspired office buildings sitting close to the freeway. To the casual driver, or unknowing passerby, this office park, the South Coast Plaza, seems to be of little distinction. Similar developments are commonplace throughout the Southern California landscape. Entering into the complex in the direction of the freeway reveals subtle changes. 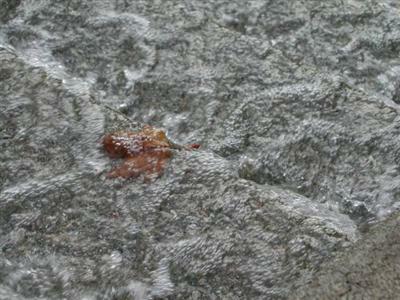 Paths of flagstone of a rose hue draw inward, hinting at something more. Continuing into this space, there is a fountain of stone, capped by stainless steel, marking the transition into a different spatial envelope. Here, sandwiched between two glass monoliths scraping the sky, sits a divine 1.6 acres. Here lies Noguchi’s scenario. Noguchi’s scenario is the embodiment of California through an artist’s eyes. Using primitive and somewhat simple forms and representations, Noguchi captured in this work the essence of California, while at the same time maintaining a purity and clarity in sculptural form. California Scenario is a composition of balances. Each element, each factor in the overall composition aids the larger message, while any factor solely by itself would illustrate only a diluted meaning. There is energy in this place, and it is odd that what is considered a landmark of landscape design and artistry should sit in such an inauspicious setting. The common user of this space may be a cigarette indulgent employee housed in the nearby office buildings for which Noguchi’s artistry is unrealized; yet perhaps even the most unknowing viewer is affected by Noguchi’s Zen-like composition. The space seems to command a certain recognition by those whose pass through it. 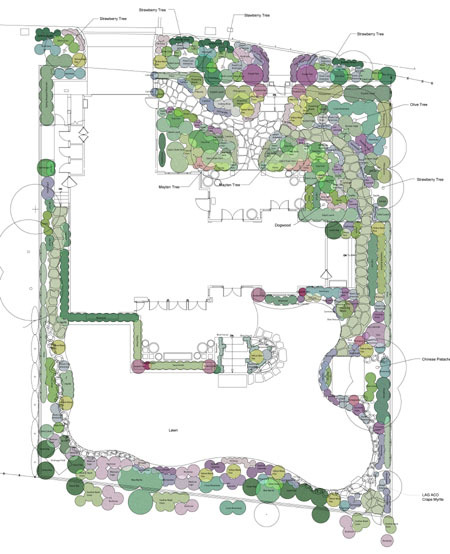 This design is executed extremely well as the spatial layout and symbolic meaning flow together in perfect harmony. The forms and symbols chosen to represent California in the work reflect both a basic understanding of archetypal units of California, and of an overall mystery. A stack of boulders, hand picked from the California desert is one such symbol. The individual piece titled by Noguchi, The Spirit of the Lima Bean, is both a wonder of construction and visually remarkable. 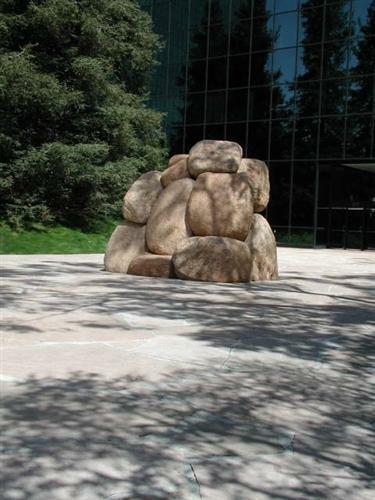 Simple in its meaning, the large grouping of rocks reflects the essence of the Lima Bean, the crop that was farmed in the area prior to development. The rest of the meanings in the work are of the same simplicity, yet they maintain effectively what Noguchi was trying to accomplish. A large sculptural form to represent the mountains, stream paths to represent the valleys and to show the movement of water, a stand of redwoods to represent the mountains. In a corner a large mound of sand and cacti represent the desert. Each of these isolated elements is effective in its simplicity. Just the two words California Scenario, and the meanings of the basic elements become clear and command appreciation. Yet, like all great works of art, not only can the meaning differ with the individual, but also it is clear that Noguchi conceptualized something more complex. Perhaps the best thing about the space is it forces no messages. Some may see a stack of rocks where there is a small ledge perfect to sit and smoke a cigarette; others may see the broadly sweeping and diversified California landscape. Noguchi’s hidden jewel, enclosed in industrialism, sits still today as it did when Noguchi first installed it, slowly aging and growing wilder by the day. Noguchi was an amazing artist not because he was just a great sculptor. He achieved greatness through an all-consuming passion for his art, and a unique appeal. As the Latin America Daily Post referred to him so eloquently, “He is a curator. A curator of time and space. A creator of a continuum of the universe that is only known to him.” For those preoccupied with landscape and with space, he did something magical. 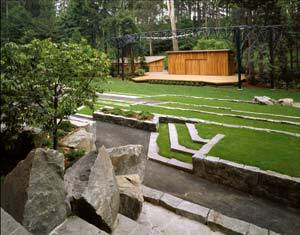 He created spaces of living art and sculpture, greater than any landscape design or piece of chiseled rock alone. He created places of meaning, metaphors beyond the scope of traditional art. Noguchi in his landscape works created an outstanding sense of concept, often tapping into mythology from around the world, which gave a human level of meaning to his often abstract stone and sculptural works. the new calling of sculpture, and it reining metaphor was the garden. Despite all his works, in his essence Noguchi was a stone sculptor. Yet as stone is both natural and expressed in space, this did not preclude him from pursuing and designing places to express his sculpture. In the end this is exactly what Noguchi did, he created space in the landscape to display his sculpture of stone and space together as one. Through his work with the landscape, Noguchi expanded his own artistry, and left a legacy far beyond the stone of the studio. In his landscape compositions, scattered from Paris to Japan and points in between, Noguchi created a theater for his legions of stone; a wonderful and mysterious tapestry through which the stone could be brought to life. — Noguchi’s carvings through the larger landscape transcend what he could do alone with any artistic medium or with any landscape by itself. Noguchi gained the rarified distinction of landscape artist. Perhaps Noguchi didn’t even see himself by this title, but he did have the realization that the landscape afforded him a much wider, sweeping appeal than through some stuffy museum alone. 1. Altshuler, Bruce. Noguchi. New York: Abbeville Press Publishers. 1994. 2. Ashton, Dore. Noguchi East and West. Berkeley: University of California Press. 1992. 3. Cummings, Paul. Artists in Their Own Words. New York: St. Martins Press. 1979. 6. Torres, Ana Maria. Isamu Noguchi: A Study of Space. New York. Monacelli Press. 2000. 7. Tracy, Robert. Spaces of the Mind: Isamu Noguchi’s Dance Designs. New York: Proscenium Publishers. 2001. Michelangelo Buonarroti was the prototypical Renaissance man. Sculptor, painter, writer, poet, architect and engineer, there was nothing that was outside the man’s reach. Not only did he excel at all these disciplines, but he excelled at them exceeding well. Practically every facet of his work was breathtaking. From his sculpture of David, to his design for St. Peters cathedral, both are to this day incredible. It is interesting to compare his two most recognized areas of expertise, painting and sculpture, with his underemphasized work in design and architecture. There are similarities and differences in their elements, style and overall significance to present day society. Although Michelangelo’s art is some of the greatest in the history of western civilization, his architecture and design work are equally important to western design and architecture. Mention the Sistine Chapel and the average person will be able to understand and visualize the paintings on the ceiling of the Vatican in Rome. Yet mention to this same person Campedoglio and they may stare at you dumbfounded. Michelangelo was so prolific in his sculpture and painting that many times recognition for his architecture and design is lacking. Yet Michelangelo’s accomplishments in design were pivotal in the evolution of western and renaissance design. His work with projects such as Campedoglio, the Porta and Strada Pia, and the plan for St. Peter’s cathedral showcase his immense architectural vision and abilities. In regard to the evolution of architecture, Michelangelo was as pivotal as he was in his contribution in art. His abilities in spatial design are incredible as well. Through his use of a distinct personal design philosophy he was able to innovate in the practice of spatial layout and architecture. As Denis Sharp put eloquently “He always subordinated invention to the needs of overall composition, which to Michelangelo was analogous with the symmetry and articulation of the human body.” Michelangelo’s strength laid in his practice of rejecting convention and designing space that did not always obey the strict rules of Renaissance design. This kind of thinking, the breakaway from Renaissance classical ideals known as Mannerism, paved the way for an expansion of thought and innovation that led to the baroque period. He played with the rules in the same way he expanded art, and created something more in the process. Campedoglio and the Porta and Strata Pia are the lasting and best examples of Michelangelo’s talent for designing space. Campedoglio, situated at the top of Capitoline hill in Rome, shows his ability for spatial design and the creation of unity. 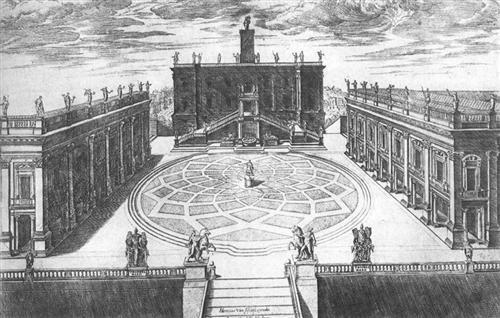 Using a modified system of geometry from the classical ideal, Michelangelo, through his use of the oval and trapezoid, was able to create a dynamic and engaging space at Campedoglio. The Porta and Strata Pia showed Michelangelo’s versatility in designing open public space. The design showed excellent definition of space, and use of scale to create a sense of monumentality, as was seen as well in Campedoglio. Both the spaces serve as reminders of Michelangelo’s versatility. Even though Michelangelo was primarily an artist, his work as a designer cannot be overlooked. The qualities he brought to his art, originality, monumentality, and overall sense of style, can be seen at a much larger scale in his few design and architecture projects. Michelangelo was always busy with work and always moving from project to project as a life of incredible art consumed him. He showed an overall skill and individuality that has never been matched and probably never will. Sharp, Dennis. The Illustrated Encyclopedia of Architects and Architecture. New York: Quatro Publishing, 1991. Hartt, Frederick. Michelangelo. New York. Abrams Publishers. 1964.